Savings are available on KD Rhein day cruise boat tickets in Germany with special deals for families, children, seniors, students, and train passengers. KD cruise lines is the largest operator of day-trip, excursion and panorama cruises on the Rhine River in Germany. KD offers many special savings deals on regular Rhine River day cruise excursions in Germany. Several cheap ticket deals are available on Rhine cruises – going on a birthday saves the most while return fares are hardly more expensive than one-way cruises. Families save on Wednesdays, cyclists on Tuesday and Thursday. Köln-Düsseldorfer (better known simply as KD) has special savings fares that are valid on all regular Rhine River day cruise boats. Savings cannot be combined – only one deal can be used per cruise. Discounts are usually only given on full adult fares. It is important to specifically ask for the savings deals when buying Rhine cruise boat tickets. Many cheap tickets are not offered automatically and some do not always make it into the latest English brochures. The savings ticket deals listed below are available on all regular Köln-Düsseldorfer (KD) boats but many of the smaller Rhein boat operators may offer similar discounts. Ask for discount deals when buying boat tickets – savings cannot later be added or refunded. It is also possible to buy discount ticket in advance, e.g. Get Your Guide currently has a KD Rhine Pass valid on all KD boats for only €35 per day – the pass is not directly sold by KD itself. The savings below are available on excursion cruises (Linienfahrten), i.e. cruises that go in one direction and make stops en route. Savings are not always available on all circular tours (Rundfahrten or Panoramafahrten), mostly sightseeing cruises in Cologne and Düsseldorf that do not stop en route before returning to the original departure port. Excursions to special events, e.g. Rhine in Flames fireworks and cruises with meals included are usually not included in the savings deals but it never hurts to ask. However, many of the other cruise lines on the Rhine (and other German river and lake boats) still honor the traditional Geburtstags-Nulltarif: a passenger cruises for free on the official birthday. An easy savings deal, offering surprisingly big discounts, is to buy return tickets (Hin und Rückfahrtkarten). The most expensive Rhine River day cruise fare is around €62 one way but only €69 return. (This fare is for example from Mainz to anywhere north of Bad Salzig, or Cologne to any stop south of Koblenz, or Bonn to Boppard). Travelers planning such long cruises may even save more if discount advance purchase tickets are available, e.g. Get Your Guide currently has a KD Rhine Pass valid on all KD boats for only €35 per day. The pass is not available directly from KD itself. The most popular section for Rhine River cruises are between Rüdesheim and St Goar via the Loreley Valley in the UNESCO World Cultural Heritage listed Middle Rhine Valley. The one-way fare from Rüdesheim / Bingen to St Goar / St Goarhausen is around €21, while the return fare is only €3 more. Cruising this part of the Rhine twice is probably more interesting than adding an extension on either end (say to Mainz or Koblenz). Travelers, who travel by German Railways trains to the departure point of a KD Rhine River day excursion cruise, receive discounts of 20% off the regular boat cruise fare. Show the train ticket or rail pass when buying the boat ticket from a KD Rhine boat ticket kiosk. This 20% discount is also given for bearers of VRS tickets – the public transportation system (buses, trams, trains) in the larger Cologne and Bonn region. It is also possible to combine Rhine and Main cruises on KD with public transportation in the RMV region (Frankfurt, Mainz, Wiesbaden, Frankfurt Airport) for significant savings. Cyclists can save by using KD Rhine boats on Tuesdays or Thursdays. On these two days, cyclists can buy two tickets for the price of one for one-way journeys only. Solo cyclists do not receive discounts. No sharing on the bicycle surcharge (Fahrradzuschlag) though – currently €2.80 per bike per cruise. Children under 4 always cruise for free. Children 4 to 13 pay only €6 per day for any regular KD Rhine River cruises (both sightseeing and excursion cruises). On Wednesday, up to three children aged 4 to 13 may accompany for free any paying adult. 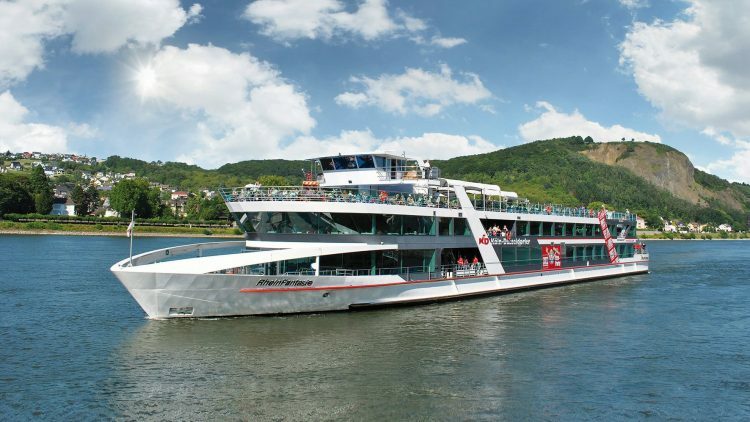 For unlimited cruising on KD circular panorama cruises – €27 per family in Frankfurt and €29 per family in Cologne or Düsseldorf. Seniors 60 years and older receive 30% discounts on regular KD Rhine boat cruise fares. KD gives discounts of 50% on regular Rhine River day cruises to school children and students up to 27 years old – IDs are required. Group tariffs are available on KD Rhine River excursions for groups of at least 10 paying passengers. Savings range from 10% for groups of 10 to 30% for groups of 30 paying cruisers. Travelers planning several Rhine River boat cruises can save by buying the KD-RheinCard. This frequent traveler’s pass cost €39 per year and gives 50% discount on all regular KD boat cruises. It can pay for itself after two long day cruises. Special discounts are also available if KD Rhine cruise boat tickets and sightseeing admission are bought in a combination ticket. Deals currently available combines Rhine excursion with admission to amongst others Sealife and Drachenfels in Königswinter; the Romanticum, cable car and fortress in Koblenz, Niederwald cable car in Rüdesheim.